Kim Yong Chol, left, former North Korean military intelligence chief and one of leader Kim Jong Un's closest aides, shakes hands with U.S. Secretary of State Mike Pompeo during a meeting, May 31, 2018, in New York. U.S. Ambassador to the United Nations Nikki Haley says it was North Korea that postponed this week's high-level talks with Washington. Secretary of State Mike Pompeo was due to meet Thursday with Kim Yong Chol, a senior adviser to North Korean leader Kim Jong Un, to discuss moving forward on a vague agreement signed back in June by Kim and U.S. President Donald Trump during their historic summit, which calls for Pyongyang to abandon its nuclear weapons program. Haley, who talked to reporters before and after a closed-door meeting of the U.N. Security Council, played down the delay saying, "I don't think there was some major issue'' for the postponement. FILE - U.S. Ambassador to the United Nations Nikki Haley speaks during a Security Council meeting at United Nations headquarters, Aug. 28, 2018. But she also took the time to blast Russia for wanting to lift banking sanctions imposed on North Korea. 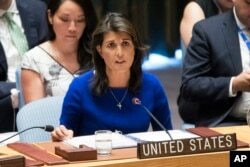 Alluding to the "carrot and stick" approach the U.S. has used to try and curb Pyongyang's nuclear program, Haley said, "We have given a lot of carrots up until now. We are not going to get rid of the stick, because they haven't done anything to warrant getting rid of the sanctions yet." During a news conference Wednesday at the White House, Trump said he is in "no rush" to finalize a deal. "I would love to take the sanctions off, but they have to be responsive, too. It's a two-way street," Trump said. Both Russia and China have said they believe the North should be rewarded for stopping missile tests and opening a dialogue with the United States. But Washington and other Western powers say sanctions must be enforced until there is full denuclearization.